I am moderating comments, yet I find some comments being published without my input. I deleted the comments, and now I can't get them back! All of the comments to my blog are going straight to Spam. These reports may be from folks who are not observing what queue they are looking at, or what the buttons do, in the Comments wizard. 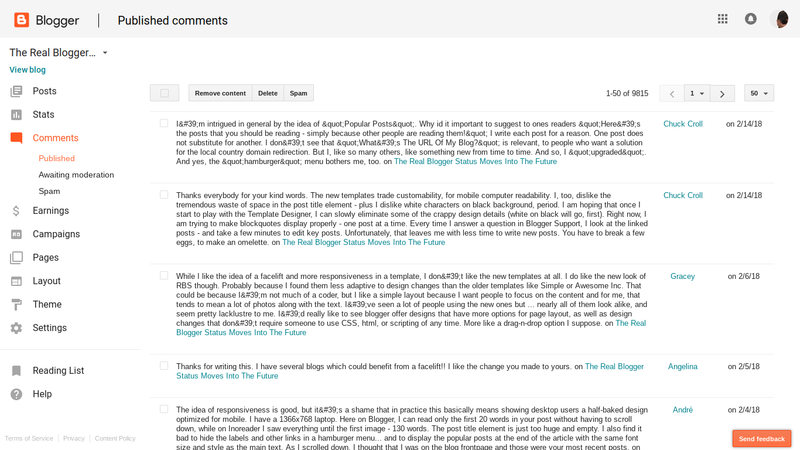 The Comments wizard has been moved from a small link in the Post Editor display, to a full dashboard page. We now have "Posts", "Stats", "Comments" - in that order, for the dashboard pages. The dashboard, with the published comments displayed. Under the Comments page, we have 3 tabs - "Published", "Awaiting Moderation", and "Spam". Each tab has its own unique set of buttons and links, for moving comments to another queue. When we move comments from one tab to another, we help to train the spam filters. Moving from "Spam" to "Published", using the "Not Spam" button / link, identifies false positives; and moving from "Published" to "Spam", using the "Spam" button / link, identifies false negatives. Note the relative effect of the buttons. "Not Spam", "Publish", and "Spam" move the comments from one queue to another. Comments moved to one queue, by mistake, can be moved to another, just as easily. "Delete" and "Remove Content", on the other hand, produce an irreversible effect - there is no "Deleted" queue, from where you might recover an erroneous deletion. So delete with great care. 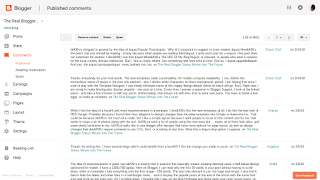 When you are moderating the comments on your blog, occasionally take a second - look at the tab heading, and make sure that you're in the right queue. Doing that may occasionally save you some confusion, or worse embarrassment. Ambiguity Comment Moderation Comments Confusion Dashboard Dashboard - Comments Deleting Comments Moderation Nitecruzr.Net Schizophrenia What? Labels: Ambiguity Comment Moderation Comments Confusion Dashboard Dashboard - Comments Deleting Comments Moderation Nitecruzr.Net Schizophrenia What? Following your advice I have managed to get the comment into the proper place. thanks for you help. I solved the issue.